Addis Ababa’s light rail transit system (LRT), launched in October 2015 as the first LRT in sub-Saharan Africa, serves some 120,000 passengers a day. The LRT may help reduce travel times for some, and lead to a safer, cleaner transport system. But in a city of 4.5 million that’s still growing and facing many development challenges, there are growing pains. 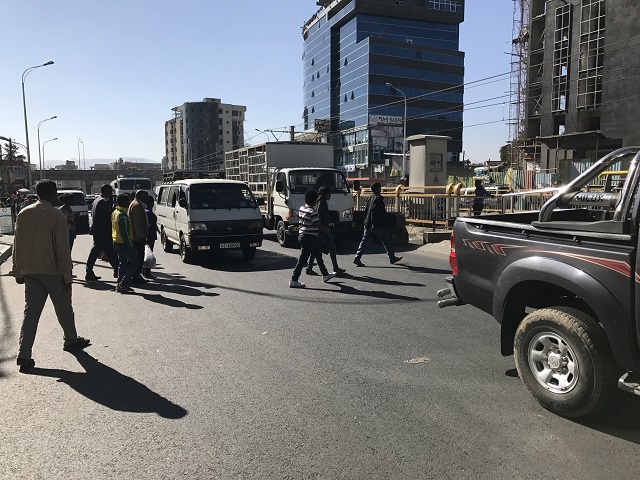 As a partner city with the Bloomberg Initiative for Global Road Safety, WRI Ross Center recently conducted a road safety inspection of Addis’s LRT corridors to improve pedestrian safety and station accessibility. The inspection covered all 39 stations on the green and blue lines. Following the inspection, WRI Ross Center provided recommendations and guidance to the city on making the station areas more accessible, safer and geared toward pedestrians. The findings from the study can be summarized in two main safety challenges. First is the lack of safety measures in street and station designs. The 19.6-mile (31.6-kilometer) LRT passes through the city center and extends to the east, west and south of the city. It passes by open air marketplaces, bus terminals, stadiums, industrial zones and residential complexes. To facilitate last-mile connectivity, other modes of transport run alongside and feed into the LRT corridor, creating congestion and dangerous conditions. Poor sidewalk conditions and road markings, lack of safe medians and traffic islands, poorly constructed ramps and stairs, and insufficient night lighting make accessing stations dangerous. In many cases, pedestrians are expected to cross four lanes of traffic in each direction with minimal protection from oncoming traffic. 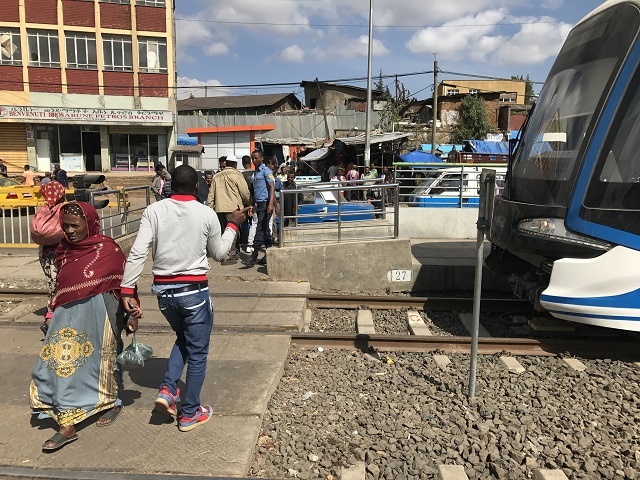 In Addis, most pedestrian crossings to LRT stations are “at grade,” or street level. To better protect pedestrians, we recommended the city create raised crossings. These both reduce the speed of traffic, as cars needs to slow down to pass over them, and provide better protection to users. While overhead crossings may seem safer as pedestrians are not coming into direct contact with traffic, research has shown that many people simply continue to cross at-grade because of the convenience, all while the city assumes safety protections have already been put in place because of the bridge. In addition to the raised crossings, WRI Ross Center also recommended lower speed limits around stations during peak hours. In June 2017, WRI Ross Center shared its recommendations in detail with different transport agencies in the city. The Transport Management Agency, the leading agency on road safety in Addis Ababa, has developed a plan to implement the recommendations and WRI Ross Center is working very closely with them to provide technical expertise. Research from WRI Ross Center demonstrates that mass public transportation systems can reduce motor vehicle use, significantly improve traffic safety, and reduce traffic-related injuries and fatalities. However, as the LRT system in Addis shows, seemingly small design decisions can make a big difference. It’s important to understand the interaction between different transport modes, in particular, to provide sustainable, safe and accessible transport for all road users. As Addis Ababa develops an integrated transportation system for its growing population, road safety should be at the center of all projects. Celal Tolga Imamoglu is the Road Safety Projects Manager at WRI Turkey Sustainable Cities. Iman Abubaker is a Health and Road Safety Project Coordinator for WRI Africa.